Imagine you are making a movie about a Pakistani rock star who leaves it all behind, takes his wife in order to save her from oppression and persecution, relocates to the US and starts all over again. Imagine what a terrible movie this can be? Enter stage Ramin Bahrani , the author / director whose popularity and success is maybe singularly owed to the admiration the late Roger Ebert expressed for him and his work wherever there was an opportunity. I have seen Goodbye Solo, and was very impressed by the intimate and honest performances, by the way the story of these people allow the audience to dive into their lives, participate in the atmosphere of the neighbourhood, feel what it is like to hang out in the New York parks or in the apartment with a large illegal family. 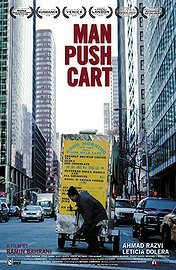 Man Push Cart – exactly those same feelings came back to me. This is masterfully casual story telling, and you can feel the director and author detesting every chance to get near a moment of sentimentality. The rock star is not rock star anymore, he is selling doughnuts and coffee out of a street cart at five in the morning. His wife is gone. Whether he sleeps at home or at the rich twerp’s apartment that he helps renovating does not matter to him. Life progresses in small steps, the whole future is visible at all times, because the future is only the next street corner, or the next party, or the next chat with the girl at the news stand. I think I still have some of Bahrani ‘s films to catch up with, and now I am really looking forward to that!